Reserve by September 1st and receive a $150.00 early sign-up discount. This majestic climb of Aconcagua “the highest mountain in the world outside of Asia and the Southern Hemisphere“ offers a truly exciting climb. Aconcagua is known by locals as the “Stone Sentinel“ and is a beautiful mountain sculpted by glaciers. It is also one of the world’s seven summits. South America’s highest mountain is a high altitude climb of moderate difficulty, requiring minimal technical skills but excellent physical conditioning. Strong backpacking skills and a high proficiency on steep and icy terrain is requisite for this expedition. High altitude experience is beneficial. The Normal Route although non-technical is physically demanding. The ascent requires basic mountaineering skills and the ability to carry a 25-40 lbs. backpack or use of porter support. Our expedition includes porter carries of mountain tents and group gear to high camps, this means tents and kitchen equipment carries are mainly handled by our staff. On carry days you will be asked to carry group equipment. For many expedition members we recommend using porter support for personal gear based on your overall experience and fitness level. The route follows the Northwest Ridge to the summit of Aconcagua. Our expedition begins in Mendoza, Argentina and travels by van to Puente del Inca the trailhead to the Horcones Valley. The approach trek follows the Horcones River to Confluencia. We spend two nights at Confluencia for acclimation with a day hike to Plaza Francia, which sits beneath the massive 10,000 foot South Face of Aconcagua. The next day we arrive in basecamp also known as Plaza de Mulas at 13,976 feet. Over the next week our expedition establishes a series of three high camps on the upper mountain. We move to Canada (Camp 1), Nido de Condores (Camp 2) and then Camp Colera (Camp 3). From there we make our summit push via the great traverse and the Canaleta to the North Summit at 22,841 ft. This is a challenging route for novice and experienced climbers alike. Aconcagua is an ideal choice for those with a combination of mountaineering skills and high-altitude experience such as Northwest climbing, Kilimanjaro, Mount Elbrus, and or the Ecuador Volcanoes. There are many opportunities for well-acclimated individuals able to climb more quickly to shorten climbing times. Contact us at info@mountaingurus.com to get started. How can I improve my chances of summiting Aconcagua? Two key factors will influence whether you reach the summit of Argentina’s “Stone Sentinel”. The first is physical preparation and the second is your choice of Mount Aconcagua guide companies. Mountain Gurus offers a trips via the Normal Route, which has basecamp and porter support. This route is non-technical, allowing climbers to focus on movement and climbing at altitude without the need of ropes or technical experience. The route is physically demanding, but the Normal Route offers a higher chance of summiting for those who are not expert or advanced climbers. The climb will provide a spectacular trekking experience as we approach following the Horcones Valley, with stunning views of the mountain. This requires excellent physical conditioning, strong backpacking skills, ability to negotiate steep ground, and experience navigating icy terrain. 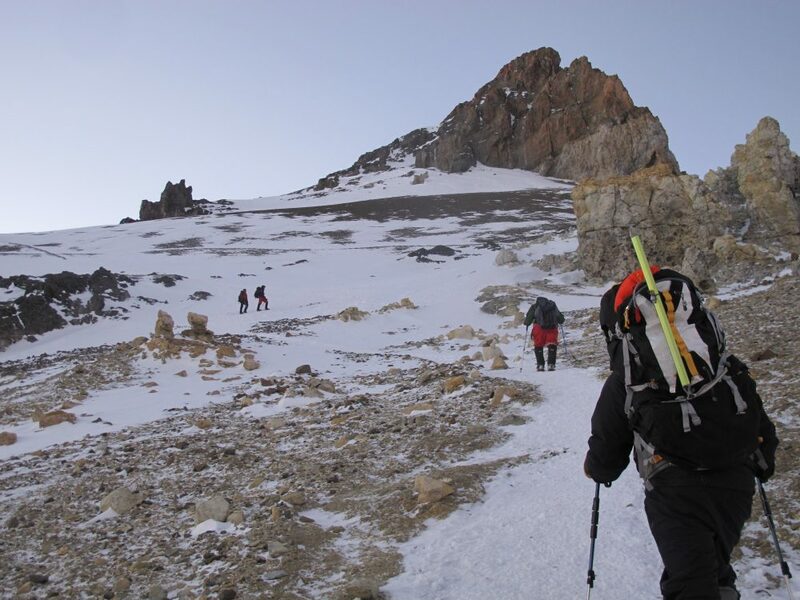 Our 20-day expedition is designed to acclimate you gradually to the high altitude conditions. Altitude sickness is one of the primary obstacles to summiting, but Mountain Gurus recommends a more gradual ascent that minimizes the risk of altitude sickness and increases your chances of success. What does an Aconcagua expedition offer? Aconcagua was formed by the confluence of tectonic plates and then carved into a stunning profile by glaciers. The view from the highest point in the Andes – and all South America – is majestic. On your way to the summit, we will experience a glimpse into the rich culture of Argentina as you explore the longest mountain range in the world (over 4,300 miles from tip to tip). We begin our journey in Mendoza – the heart of the Argentine wine industry – known for its open air cafes, asados, and Malbec. From there, we reach the trailhead at Puente del Inca, one of the few mountain passes that the ancient Incan Empire used to access this region. Our 16-mile approach up the Horcones Valley will allow us to stretch the legs and acclimatize before arriving at Plaza de Mulas Basecamp. From here we utilize three high camps as we slowly make our way to the summit. You will be able to test your strength and endurance at high altitudes without dealing with the technical aspects of glacier travel or fixed lines. If you are working your way through the Seven Summits, climbing Aconcagua is an excellent training stage before Everest. What are the costs of climbing Aconcagua? 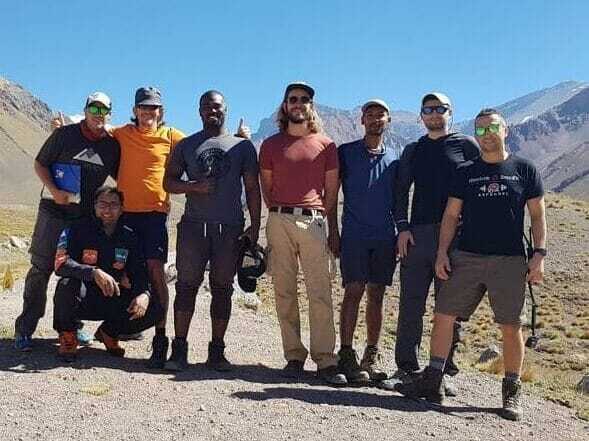 Aconcagua is a relatively low cost expedition for a 20-day climbing trip, this is affordable, particularly for the cultural and high altitude expedition experience. Mountain Gurus will cover most land transportation in Argentina, hotel stays, tented accommodations on the mountain, meals, guides, and mule transport of equipment to and from basecamp. Group gear such as tents, stoves, and climbing equipment are also included. You will need to arrange your air fare, Aconcagua Climbing Permit (varies by departure date), porter service (if desired), medical services (if required), and gratuities to service personnel. What are the risks of an Aconcagua expedition? As with any high altitude adventure, there are risks involved. Some can be mitigated by proper preparation and many will be mitigated by our professional guide staff. Any issues, physical or altitude related, are best dealt with early to ensure a safe and successful trip. All of Mountain Gurus staff are well versed in wilderness first aid and have extensive experience working at altitude. Our staff is trained to keep you safe and enjoy your experience. Why Mountain Gurus is the best choice for climbing Aconcagua? Mountain Gurus strives for a challenging, enjoyable, and safe climbing adventure. We pride ourselves not only on our high summit success rate, but more importantly to our safety record. Our in depth knowledge of the mountain and culture bring our climbers a rich and rewarding experience. Mountain Gurus plans our expeditions to optimize your climbing experience while respecting the culture and people of our host country. We adhere to Leave No Trace Principles to minimize the environmental impact of our adventure and ensure it will be pristine for future generations. Arrive Governor Francisco Gabrielli International Airport in Mendoza, Argentina (MDZ). Transfer from the airport to hotel on your own. A scheduled transfer can be arranged upon request. The expedition begins in the vibrant city of Mendoza, known for its rich Argentine culture and open-air street cafes. Enjoy a self guided walking tour of the Plaza Independencia and the popular Sarmiento walkway. During the afternoon we have an expedition orientation, a Leave No Trace discussion and equipment check. Dine in one of Mendoza’s popular restaurants on your own or with members of the team. After registering with Aconcagua Provincial Park and obtaining permits, we transfer in private vehicles from Mendoza to the small resort town of Penitentes. In Penitentes we organize gear and enjoy a traditional Argentine meal before heading to the mountain. After checking in with the park authorities we will make our way to Confluencia. On our three-hour hike in we will be greeted with a view of Aconcagua. Upon arrival in Confluencia you will enjoy refreshments and a tour of camp. After a good rest, staff will set up tents and take some time to explore the surrounding area. The group will spend two nights in Confluencia with full meals and hot drinks available throughout the day. Today we will make a day trip to the impressive Cara Sur of Aconcagua. The South Face of Aconcagua is famous for its difficult ascents, where many of the best climbers in the world come to test their skills. This was perhaps one of the last great faces to ever to be climbed. Rising 10,000 vertical feet from the valley below it is awe-inspiring. Our goal is to acclimatize with light packs and return to camp for a good nights rest. After ascending the Horcones Valley we’re rewarded with remarkable views of Aconcagua and the surrounding peaks. We end our approach trek at base camp known as Plaza de Mulas. Here we enjoy the high-quality services provided by our base camp hosts. Camp is situated on the edge of a rocky glacial moraine. After we settle into base camp and spend the day organizing gear and acclimatizing. This is a good opportunity to get to know camp, take a shower and explore the area. The park service requires a brief medical check-up with the base camp physician. Today we do an acclimatization hike to the summit of Cerro Bonete. For many climbers, this will be their first summit over 5,000 meters. This peak is one of many that surround the skyline around basecamp. The ascent of Aconcagua follows a logical acclimatization schedule of equipment carries and alternate rest days as our group climbs to establish a series of three camps on the upper flanks of the mountain. Today we carry to Camp Canada and return to Plaza de Mulas. We will carry food, fuel, and other supplies to use in camps higher on the mountain. The climb begins through tall pinnacles of ice known as Penitentes, and then follows switchbacks that lead us steadily up to Camp Canadá. We will rest and recover today in preparation for our movement up the mountain. Today we move to Camp Canada. We establish camp on a rocky bench protected from the wind. Team members will carry personal gear and additional supplies. Porters will carry sleeping tents. An early morning will lead us up to our second camp, Nido de Condores. Each climber will be responsible for carrying personal equipment only. Porter staff will carry expedition equipment, food, and sleeping tents. In an effort to acclimatize before our summit bid we will take a rest day at this lower elevation. Rest, hydrate, and eat. Carry gear and supplies to our high camp. Return and sleep at Nido de Condores. Move to Camp Colera. After settling in we prepare for summit day. We will carry our personal equipment and any extra gear needed for the summit attempt. Porters will carry sleeping tents. We begin our summit day in the early hours of the morning, climbing the northwest ridge until we arrive at what remains of the Independencia Hut (21,476 ft.), once considered the highest refuge in the world. The climb continues past Windy Col (Portezuelo del Viento) and traverses the west face (Gran Acarreo) to the base of the Canaleta. The Canaleta renowned for being the most challenging part of the route is a narrow ravine rising nearly 900 feet to the summit. Steadily we make our final steps before reaching the top, traversing the narrow Guanaco ridge to the higher North Summit at 22,841 ft. A large metal cross marks the highest mountain in South America. As our team looks across the vast mountains of the Andes, exchanging summit photos, one can’t help but feel total exhilaration from the day’s accomplishments. In the foreground stands the lower South Summit and directly below lies the famous 9,000 ft. south face of Aconcagua. We descend to camp three and spend the night. We pack our camp and descend back to basecamp. Porters will carry sleeping tents. After a full day’s trek via the Horcones Valley we finally reach the park entrance known as Puente del Inca. Transport to Mendoza. Enjoy Mendoza before an evening flights home. Two additional days are scheduled for weather or acclimatization as needed. $700.00 deposit includes reservation fee, due with application. Glacier Glasses: Essential eye protection at altitude. Wrap around style or side shields. Goggles: Dark lenses to help with snow and wind. Baselayer Tops: Two synthetic long-sleeve shirts. Lightweight insulated jacket: This breathable but wind-and-weather resistant jacket. Down Parka: Heavyweight 700+ fill down. Softshell Gloves: One pair. Leather palms offer durability and grip. Mountaineering Boots: Full shank crampon compatible. Double plastic mountaineering boots or Heavy weight synthetic/ hybrid mountaineering boots are required. Mediumweight Socks: Two pair of wool or synthetic socks. Heavyweight Socks: Two pair of wool or synthetic socks for sleeping in and for summit day. Note: Please read our Mountaineering Boot and Crampon guide for more information. Sleeping Bag: Bring a warm bag (rated to minus -20ᵒ fahrenheit). Sleeping Pad: A full-length closed-cell foam pad and/ or an inflatable pad. Backpack: One 100L pack with good support, adequate to carry personal, and group gear. The pack should fit properly, have a good waist belt, and be able to carry gear between 45-60 lbs. Duffle/zip Bag: One large size 120 to 150L, transporting gear to basecamp via mules. Liner Bags: 2-3 Large plastic contractor bags. Ice axe: 55-65cm mountaineering axe. Crampons: 12-point steel with anti-balling plates. Trekking Poles: Adjustable and collapsible with snow baskets. Water Bottle Parkas: Two, fully insulated water bottle covers. A valid passport is required for American citizens to enter Argentina. American citizens do not need a visa for visits of up to 90 days for tourism. The approach to basecamp requires a 16-mile hike carrying a 20 lbs. pack, utilizing mule support for climbing gear. Beyond basecamp all climbers are required to carry 25-40 lbs. packs as we establish a series of camps higher on the mountain. On summit day we will be breathing heavy, moving slowly, and carrying our 25 lbs. summit packs. Being in top physical and mental condition is key to succeeding on this climb. Prior to the expedition we recommend taking a mountaineering course to master the skills essential to reaching the summit. Here’s a suggested progression of climbs before attempting Aconcagua. Note: Porter services are available for carry and move days on the mountain, however this cost is not included in the price of the trip. Please contact us for pricing. What is the Aconcagua climbing permit cost? The cost for the climbing permit varies depending on the time of year your climb takes place. Early and late season climbs are less expensive, with the December to January time-frame being slightly more expensive. As the price fluctuates year to year, our guide team will reach out closer to your trip start date to confirm. Please note, it is recommended to bring the permit fee amount in United States dollars. What if I need to hire a porter? Porter services are available at basecamp and can be used for select days or the entire trip. Cost is based on load weight and distance carried. Full load 20 kg., Half load 10 kg. Prices change each season. We recommend budgeting between $800 – $1200 if you plan on utilizing porter service throughout the climb which is payable by credit card. Will I be able to contact friends and family while on the mountain? Most cell phone providers will work in Argentina, check your provider for overseas rates before you leave. Beyond this there is wifi service at basecamp for a nominal fee. Cell phone and wifi service is not available above basecamp.